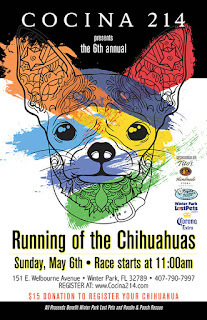 Winter Park, Fla. – April 23, 2018 – On Sunday, May 6, Cocina 214 - Central Florida’s famed Tex-Mex restaurant, will host its sixth annual Running of the Chihuahuas event at its Winter Park location. This family-friendly event invites locals, visitors and pet-lovers alike to continue the Cinco De Mayo celebration with the beloved Chihuahua run, fresh margaritas, authentic Tex-Mex cuisine and festive delights. Proceeds from the Chihuahua run will benefit Winter Park Lost Pets and the Poodles and Pooch Rescue of Florida. As the pups gear up to race, attendees can enjoy music from a live DJ, take pictures with their furry friends in a custom photo booth and enjoy delicious drink specials from Cocina 214’s outdoor bar.